10-15 2 Two Unknown Males born 1825-1830. 20-30 1 Unknown Female born 1820-1830. 50-60 1 Apparently Stephen’s wife. FNU son of Stephen Long born after 1825 and before 1830; died 6 Jan 1846. That still leaves three males in the household where one of them could be my wife’s 2nd great-grandfather, Samuel Aquilla Long. Next, I found an appeal to the North Carolina Supreme Court on Google Books. [ii] The appeal mentions that Stephen Long sued William L. Mizell. 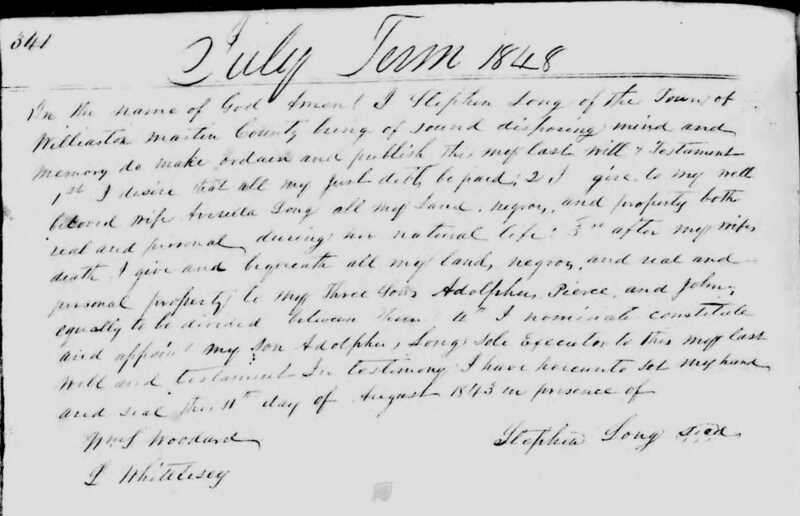 Before the case came to the Martin County Superior Court, in June 1849, Stephen Long died. The judge postponed the case until the next session of the court, August 1849. For this session, Edgar A. Long, the executor of Stephen’s estate, was the new petitioner. After the case was heard and decided but before any execution orders were issued, Edgar A. Long died. Who was going to receive the money owed was to be determined by the State Supreme Court in 1851. It is often the case that the eldest son is the executor of a person’s estate, so I penciled in Edgar A. Long as the oldest son of Stephen Long. Unknown Male born 1800-1810 – Possibly Edgar A. Long who died in 1849. Now knowing there was an executor for Stephen Long’s estate, I began looking for probate or will for Stephen. In the name of God Amen! I Stephen Long of the town of Williamston, Martin County being of sound disposing mind and memory do make, ordain and publish this my last will and testament. 1st I desire that all my just debt be paid. 2[nd] I give to my all loved wife, Frerella [Avrella??] Long all my land, negros, and property both real and personal during her natural life. 3rd after my wife death I give and bequeath all my land, negros, and real and personal property to my three sons, Adolphus, Pierce, and John equally to be divided between them. I’ve learned that Stephen’s three living (in 1843) sons were Adolphus, Pierce, and John. I also learned that Samuel Aquilla Long was not one of Stephen’s sons. So, it is back to the drawing board. I didn’t see any other reasonable candidates other than this in the 1840 Census. I know that the 23-year-old Samuel Aquilla Long could have been living anywhere during the 1840 Census, but I’m hoping he was probably living with his parents during the 1830 Census. When I next return to researching this line, I’ll look at the 1830 Census and see what possibilities are there. [ii] Google Books: North Carolina Reports, Vol. 34 — Cases Argued and Determined in the SUPREME COURT of North Carolina — June Term, 1851 to August Term, 1851 both inclusive by James Iredell (Volume 12) — Annotated by Walter Clark (2nd anno. Ed.) — Reprinted for the state by E. M. UZZELL & C0. Presses of Mitchel Printing Company, Raleigh, N. C. 1917. https://books.google.com/books?id=19ozAQAAMAAJ.